Members of the armed and security forces block the way in a settlement of the Novoselitsky district, where a local police station was recently attacked, in Stavropol region, southern Russia. 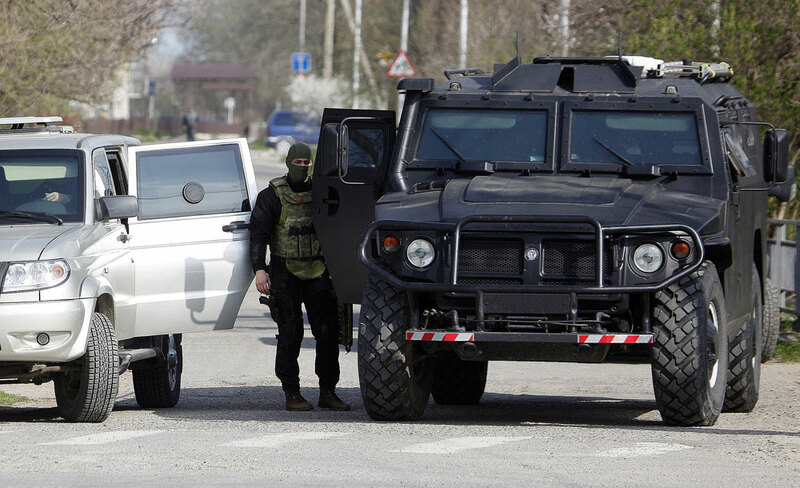 The three men who staged explosions outside a police station building in Stavropol have been identified, they are local residents, a spokesperson for the Russian Investigative Committee (RIC) told Interfax on April 11. "The three men who today attacked the Russian Interior Ministry's administrative building for the Novoselitsky district and subsequently blew themselves up have been identified. They are previously convicted (including for a murder) residents of the village of Kitayevsky, Novoselitsky district: Zaur Akayev, born 1983; Ramazan Khaibullayev, born 1991; and Isai Abdulatipov, born 1996," the spokesperson said. According to the inquiry, on April 11, at around 10 a.m., the three men attempted to infiltrate the administrative building of the Russian Interior Ministry department for the Novoselitsky district, activating explosive devices and blowing themselves up in the process. "As a result of the explosions, the police building and nearby vehicles sustained technical damage. None of the local residents and law enforcement officers was injured," the spokesperson said. The criminal case launched on the charge of "attempting on the life of a law enforcement officer" has been handed over to the RIC Main Investigative Directorate for the North Caucasus Federal District. The work of the investigative team at the scene is being coordinated by RIC deputy chairman Boris Karnaukhov.